Symptoms for these rabbit mites include excessive dandruff, scaly skin, and rabbit hair loss from itching and scratching. A more serious form of rabbit mites, the Sarcoptes species of mites cause the condition mange. Mange brings with it patchy hair loss, scaly skin, and the possibility of skin infection. These mites can carry other diseases and lead to infections, so it is important to seek treatment for your bunny quickly. 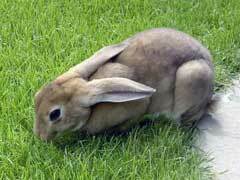 The Psoroptes or Chorioptes species of rabbit mites infect the ear, bringing on what is often called ear canker. Ear canker will be signaled by repeated head shaking, scratching, and in some cases with rabbit breeds with straight ears the ears will droop. There is also a dark, reddish brown crust that may form in the ear. This is one of the more painful infestations of rabbit mites, and can lead to a rabbit ear infection. Ivermectin, given orally or injected, is the conventional method for treating many forms of mites. Some veterinarians have also had luck with Revolution, an over the counter brand. While this can be administered at home, always use caution and research the proper dosage for a rabbit. Also, never use Frontline, as this contains chemicals poisonous to rabbits.